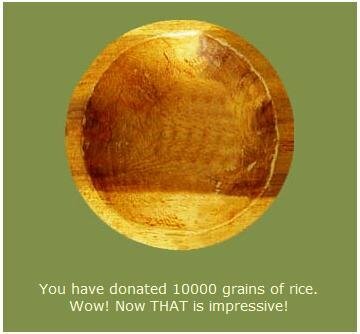 I like this idea of playing a guessing game to enhance my knowledge and vocabulary and on the same time making daily donations of rice to feed the hungry. Subjects range from Art, Chemistry, English, Math, Languages and Geography. 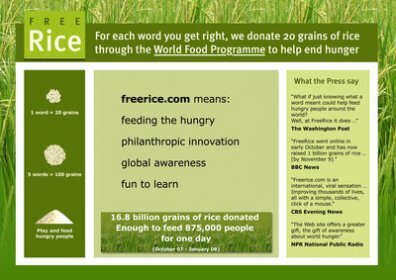 Every correctly guessed word and 20grains of rice are donated through the World Food Program. The Art game involves guessing what artwork was painted by what artist and is fun to play. But most importantly we are able to make a difference! Take a look at this video and see how our game playing can help feed people all around the world. definitely gets a thumbs up from me. I have added a widget to the left side bar to remind myself to click each day!